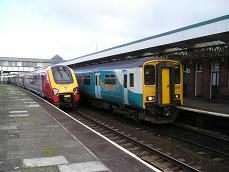 Llandudno Junction is still a large station, but uses just three platforms. My train is waiting on platform 3, as I arrive on platform 4 on my Virgin Train from Chester. The driver jumps onto the train carrying the token and we leave on time. There are only two other passengers apart from me and I have the whole of the first carriage to myself. We leave the main line and start going south on a single track, with views of the mountains to the right. We scrape past a few trees in full bloom and then have a great view across the Conwy Estuary. We stop at Glan Conwy, which has a fine station building all painted in white. Two cyclists get on the train. Trees get in the way of the view of the river briefly and we are now on unwelded track, which adds to the ambiance of this branch line. The land starts to get hilly on the left side, as the estuary changes into a river on the right side. The train is doing a steady 40 mph, as you get a quick glimpse up the valley. The views on the right are quite magnificent, though as usual the mountaintops are covered in cloud. We stop at Tal-y-Cafn briefly, not to pick up passengers, but so that a guard can wave his green flag to let us proceed across the level crossing. The station again has a fine white painted cottage. It's quite steep on the left side, but still wide open with the river on the right. It's very wooded here, so the view of the river keeps disappearing. We curve to the left as it becomes more open once again on the left and go straight through Dolgarrog, which has a tiny perspex shelter. We are now right next to the river, which is much narrower now. We stop at Llanrwst signal box, where the signalman takes the token and then come into Llanrwst North station, which has two platforms. The down platform has a large brick shelter, whilst the up platform has the station building. We don't actually stop here, but slowly pass through and then half a mile further on, do stop at Llanrwst station. It has just a perspex shelter, covered in graffiti. No one gets on or off. We are now in a wide flood plain, with the hills about half a mile away on the left, but much nearer on the right. I notice the remains of a single track off to the left and then we cross the river Conwy for the first time. There are plenty of sheep in the fields on the left, as we travel along the edge of the hill on our right, before entering a cutting for the first time on this journey. We emerge to see the river below us on the left and then we cross it again. We then go past a miniature railway as we come into Betws-y-Coed station. It has a single platform, with a large station building intact, but it is now in use as a private residence and business as there are two perspex shelters for passengers. I notice that there are some full sized carriages next to the miniature railway, which has an overhead electrical supply as well. Moving away we are higher up the mountainside now with the river faster flowing below us on the left and then we enter the first tunnel of the journey. It's also heavily forested round here as the train brushes against more branches. The train seems to be straining as we start to climb higher and the track screeches in parts. You can see the A470 below us on the left, which we go over on the Cethin's Bridge. The track curves strongly to the left and the right as we hug the left hand mountain now and have the river valley on the right. You get a brief glimpse of the first mountain on the right, before we go into another tunnel. We then pass through Pont-y-Pant station, which again has a white cottage, which I notice is for sale. Then it's another tunnel before we reach Dolwyddelan, which has some plants on its platform and just a perspex shelter. We don't stop, but continue to climb and twist and turn on this unique mountain railway. We have a great view of Mount Carnedd Moel-Siabod on the right, with a castle on a hilltop in front of it. Then it's into more cuttings, before we pass through Roman Bridge station, which again has a white station building, which is now privately owned. There are some great views round here across the valley to the mountains on the right, but the track is very twisty and we are still climbing. There are plenty of sheep round here of course and then a large mountain looms up in front of us and we enter the longest railway tunnel in Wales. As soon as you are in it, you can tell that you are starting to descend. It takes about ten minutes to pass through it and then we emerge into another world - just slate everywhere. Also the sun has disappeared and it's quite cloudy. We slowly go round the bend and arrive in Blaneau Ffestiniog station, which has the narrow gauge railway right next to the main station. There is now only one platform and the small station building is painted over in Arriva turquoise, though there is a small perspex shelter. The train is actually about ten minutes early, presumably because it didn't stop at most of the request stops on the way. Only three people get off, plus me, but when the return journey starts there are at least ten passengers on, mainly locals going shopping in Llandudno or Chester, plus a few tourists, who get on during the return journey. The line used to continue on to Trawsfyndd power station in the mountains further south, but there is now a buffer stop.